RGV FC's Jesús Enriquez challenges Tulsa goaltender Fabián Cerda, but was called offside, during the second half of their game Saturday, July 7, 2018 at H-E-B Park in Edinburg. The Toros tied the game 1-1. EDINBURG — As RGV FC Toros midfielder Jesus Enriquez jogged to the bench after scoring during Saturday’s match, he kissed the underside of both of his wrists and then bent forward to touch just above his shin guards. On one wrist, he has a tattoo bearing the names of his sisters. On the other, he wears a bracelet his mom gave him. He sports another bracelet above his shin guards, this one a gift that he received from a niece when he was playing in Mexico for Club Tijuana. Every week on the pitch, Enriquez’s family is not far from his mind. His loved ones were also among his first thoughts as he scrolled through his Twitter timeline in recent weeks and saw news of children being separated from their parents as a result of President Donald Trump’s zero tolerance immigration policy. Enriquez, 20, said his parents emigrated from Mexico and lacked the proper documentation to travel from the family’s home in California to see him play in Tijuana. He also recalled how often he saw people young and old turned away when he would make the trip from Tijuana back home. When he heard a couple weeks ago that RGV FC keeper Nico Corti wanted to start a fundraiser to help those impacted by family separation, he jumped at the opportunity to participate. Corti, who emigrated from France with his father at age 10, was moved by the experience of living so close to the U.S.-Mexico border during his first season as a Toro. He decided late last month to launch Reunite F.C., a fundraiser for the Texas Civil Rights Project to help families separated during the immigration process. After researching different possible avenues for support, Corti chose to reach out to TCRP, which aims to provide legal representation to separated families. Corti said TCRP encouraged him to start building from the ground up, so he developed an EveryAction page and various social media accounts to begin spreading the word. He started with teammates. Enriquez, Kyle Adams, Nicolas Perea, Bryce Marion and Todd Wharton were among a group that jumped on board almost immediately. Each pledged a dollar amount per game played, win, goal or other metric in the month of July, while some also pledged to contribute based on the accomplishments of their favorite World Cup squad. 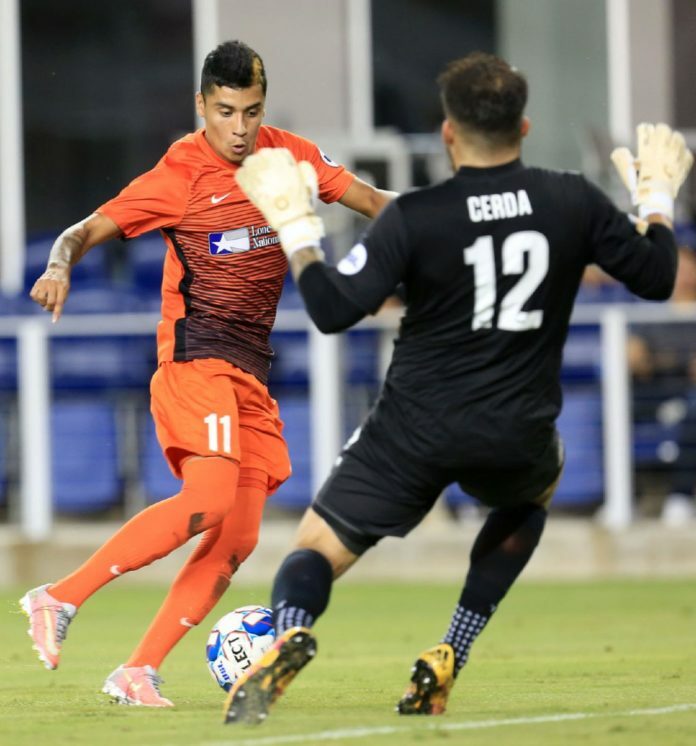 The Toros are scheduled to play five matches in July, including an exhibition against Liga MX’s Club Santos Laguna at 8 p.m. tonight at Edinburg’s H-E-BPark. Corti pledged $10 per game played, $10 per win and $5 per save, plus $10 per France win and $5 per France goal in the World Cup. He said the TCRP set a goal of $10,000 by the end of July, and to this point the little more than half-dozen contributing players have raised about $500. Corti said recruiting members of other teams to join the fundraising campaign has been more difficult than expected, but he has seen players, friends and family make individual donations in lieu of a pledge. Corti was quick to note that the Toros players involved in Reunite F.C. are acting as individuals rather than as a representation of the RGV FC or Houston Dynamo organizations. Still, Toros coach Gerson Echeverry, whose parents emigrated from Colombia, was supportive of the movement.